If the rumor mill is to believed, the Audi RS6's official horsepower number undersells the überwagon by about 30 equines. But even if the inside line doesn't pan out, the RS6 is still a spec collector's dream date: Twin-turbo V10 producing 479 ft-lbs of torque available at between 1,500 rpm and 6,250 rpm, maximum power arriving at between 6,250 rpm and 6,700 rpm, all channeled through a six-speed tiptronic massaged by algorithms. Dynamic ride control with optional three-stage damping adjusts to a desired level of stiffness. Ceramic brakes are available for an undisclosed sum. Supercar or station wagon? The mind reels. Attention childless members of the autobahn-commuting German business elite. We're up for adoption. Outstanding top performance and maximum dynamism combined with excellent suitability for everyday use are the impressive features of the new Audi RS 6 Avant, which will be unveiled to the public for the first time at the IAA 2007 in Frankfurt. A newly developed V10 engine with FSI direct injection and twin turbochargers, permanent quattro four-wheel drive and sports suspension with Dynamic Ride Control DRC set the standard for high-performance vehicles in the luxury class. 426 kW (580 bhp) and a maximum torque of 650 Nm add up to an unforgettable performance experience. At the same time, the new Audi RS 6 Avant offers a high standard of travel comfort - on long journeys, too. The Audi RS models from quattro GmbH are the ultimate in sportiness, complemented by powerful and elegant design, exclusive equipment and perfect quality. It has also meanwhile become a good tradition that their sports performance is combined with the high utility value of an Avant: the very first Audi RS2, which appeared in 1993, was only built as an Avant model. Although the unique Audi RS driving sensation can now be experienced in saloon, Avant and Cabriolet models - as is the case with the current RS 4 - customers especially appreciate the combination of dynamism and versatility that an Avant offers. The new Audi RS 6 will therefore only be available as an Avant to start with, with the unrivalled combination of 580 bhp and a maximum 1,660 litres of luggage space. 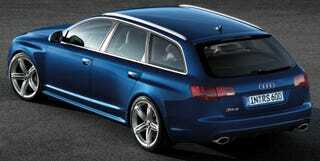 The Audi RS 6 Avant will be launched in April 2008. The Audi RS 6 redefines the term "high performance" in the business class. With its 426 kW (580 bhp), it is the most powerful model in the current Audi range and - with the exception of pure racing cars like the Le Mans-winning Audi R10 TDI - the most potent Audi of all time. But not only that: it is also clearly superior to all competitors in the top performance category. The ten-cylinder V-configuration engine in the RS 6 is based on the V10 powerplants of the Audi S6 and Audi S8, but has been redeveloped in practically every respect to attain the significantly higher level of performance. The twin turbochargers ensure an impressively constant stream of power over the entire engine speed range: the mighty peak torque of 650 Nm is available across the entire range from 1,500 to 6,250 rpm; maximum output is available between 6,250 and 6,700 rpm. The ten-cylinder concept provides the ideal basis for a high-performance unit of this calibre. The V10 is unusually compact with an overall length of 670 millimetres and is very light with a total weight of 278 kilograms. TFSI technology from Audi, the combination of direct injection and turbocharging, ensures efficient power output, based on extensive experience in the field of motor sport: the R8 racing car, a pioneer of TFSI technology, captured a series of victories for the brand with the four rings at Le Mans. FSI direct injection delivers precisely metered amounts of fuel into the combustion chambers at a pressure of up to 120 bar. This permits a compression ratio of 10.5:1, which is very high for a turbo engine. Remarkably efficient combustion is the result. The engine is thus content with a standard consumption of 13.9 litres - a very good figure in view of the potential offered. A further feature adopted from racing technology is the dry-sump lubrication system used on the V10. By virtue of the elaborate design of the oil pump module and oil tank, reliable lubrication of all engine components and both turbochargers is guaranteed, even with constant lateral acceleration of 1.2 g.
Thanks to FSI technology and the optimised design of the turbocharger and air ducts, the ten-cylinder unit is extremely responsive and converts minimum movements of the throttle into dynamic acceleration. Yet the twin turbo is by no means a rough-and-ready sports engine: it runs smoothly and with refinement, as is typical of a ten-cylinder unit. When accelerating, of course, its dual-branch exhaust system with two oval tailpipes produces that sonorous sporty, throaty sound - an essential feature of a high-performance automobile. Those who wish to enhance this daily delight for the ears even further may opt for the alternative sports exhaust system. The six-speed tiptronic is the perfect complement to the self-confident, powerful character of the RS 6. Its hydraulics and control system have been optimised to achieve exceptionally short shift times; the ratios have been adapted accordingly. It goes without saying that the new RS 6 transmits its tremendous power to the road via quattro permanent four-wheel drive. The latest generation not only provides substantially more driving safety and stability than a vehicle with rear-wheel drive, it also underscores the distinctly dynamic character of the RS 6. In its basic setting, the centre differential distributes 40 percent of the power to the front and 60 percent to the rear wheels - this slightly rear-biased setup produces particularly dynamic handling characteristics. The suspension of the Audi RS 6 has been consistently designed for maximum dynamic performance along with good travelling comfort - on long journeys, too. Shock absorber and spring settings as well as the entire elastokinematics of the four-link front suspension and the trapezoidal-link rear suspension have been adapted to the new level of performance. The characteristics of the servotronic speed-dependent power assistance have also been retuned. The steering is consequently very sensitive and delivers optimum feedback from the road. All in all, in terms of driving feel the RS 6 combines the precision and cornering ability of a sports car with the relaxed straight-line stability of a comfortable cruiser. The standard Dynamic Ride Control DRC, familiar from the current RS 4 and consistently enhanced, plays a major role here. This system reduces pitching and rolling movements about the longitudinal and transverse axis of the vehicle in a particularly ingenious way - entirely without the aid of electronics and solely according to the laws of fluid dynamics. With Dynamic Ride Control the shock absorbers are connected diagonally with each other via two oil lines and two control valves. Body movement - e.g. rolling when cornering at high speed on an uneven road surface - produces flows of oil, which generate additional damping force. As a result, the RS 6 boasts even more directional control through bends and reacts with substantially more precision to the steering inputs of the driver. Dynamic Ride Control on the new RS 6 can be supplemented if desired with optional three-stage damping. This allows the driver to select the handling characteristics according to his/her personal preferences or chosen route. In the comfort setting, the sports suspension plus provides remarkable ride comfort, in the dynamic program it adjusts superbly to an enthusiastic driving style and in the sport mode it delivers maximum driving precision. The sporty setting of the electronic stabilisation program ESP is an ideal match here: the point of intervention is very late, permitting a high degree of driving enjoyment whilst fully maintaining driving safety. Alternatively, the ESP may be completely deactivated. An athlete of such exceptional calibre as the Audi RS 6 naturally requires an outstanding brake system. The standard 19-inch steel discs have been designed for maximum load. They consist of an aluminium brake-disc chamber and a cast friction ring, both connected with each other in a floating arrangement via metal pins. This design increases thermal stability and reduces weight. Optionally, in conjunction with 20-inch wheels, a ceramic brake system is available: it boasts discs with an impressive diameter of 420 millimetres at the front and 356 millimetres at the rear, which endure the most extreme thermal loads with ease and have a very long operating life. Equally impressive are the tyre sizes: the standard 19-inch wheels with the new 10-spoke design are shod with size 255/40 R 19 tyres; the optional 20-inch wheels are fitted with 275/35 R 20 tyres. Its independent design lends the Audi RS 6 a striking and self-assured look - without any hint of aggression. In fact, the clear front-end design with the remodelled bumper and accentuated apertures evidently follows function: the high-performance powerplant requires a considerable amount of air to breathe as well as for cooling. The fact that it belongs to the RS family is emphasised by the matt aluminium-look single-frame grille featuring a highly polished black guard in a diamond design. The headlights on the Audi RS 6 are miniature works of art in high-tech terms: to create space in the front apron for additional air flow, the halogen fog lights have been integrated alongside the bi-xenon headlights, optionally with adaptive light, the cornering light function. The LED daytime running lights strip adds a distinctive touch: ten LEDs at the lower edge of each headlight unit lend the Audi RS 6 a striking appearance, by day or night. A flat cover at the top of the headlights sharpens the "look" of the business/sports car. The taillights, too, largely employ LED technology. Striking design derived from the "Ur-quattro"
The rear of the Audi RS 6 is characterised by the oval exhaust tailpipes and the diffuser-look apron. A roof spoiler completes the aerodynamic fine-tuning of this high-performance vehicle. The side outline is distinguished by wide, flared wheel arches. Like the engine compartment lid, the front wings are made of aluminium in order to reduce weight. They accommodate the mighty wheels of the new Audi RS 6, yet are also reminiscent of a milestone in automotive history: the flat tops of the wheel arches with their clear edges were counted among the design elements of the Audi quattro - the pioneer of permanent four-wheel drive from the year 1980. A metallic/pearl effect paint finish is standard; new colours Sepang Blue, Monza Silver and Monterrey Green are exclusively reserved for the RS 6. The interior of the new RS 6 offers an impressive synthesis of sporty elegance and exclusiveness. The extremely high standard of craftsmanship typical for Audi is complemented by an equally sporty and elegant combination of top-class materials. Carbon fibre, aluminium, leather and Alcantara create an ambience that is unique even in the world of high-performance cars. The main control element is and remains the steering wheel: on the RS 6 the customer can choose between the multifunction sports steering wheel with a 3‑spoke design and the particularly distinctive flat-bottomed RS sports steering wheel, likewise with multifunction controls and shift paddles for the transmission. The cockpit in the typical RS design additionally features a boost pressure gauge. Displays for boost pressure, oil temperature and lap timer can be called up via the driver information system. The inlays are made of carbon fibre and edged in aluminium, the cockpit trim gleams with its piano black finish. Additional highlights in the interior are provided by the aluminium-coloured keys of the MMI terminal on the centre console, the milled-finish door handles and the aluminium-look sports pedals. The highly contoured sports seats are covered in a combination of leather and Alcantara with an embossed RS 6 emblem or optionally wrapped completely in Silk Nappa or Valcona leather. This high-performance vehicle naturally deserves an appropriate level of standard equipment. In addition to design and technical elements specific to the RS 6, this includes the audio system with powerful Bose Surround Sound, heated seats at the front and rear, a tyre pressure monitoring system and Audi parking system plus. Together with the wide range of high-tech options for the Audi A6 series, every RS 6 can be perfectly matched to the driver's individual wishes. The Audi RS 6 is consequently a sporty business car with great versatility, making it suitable for a variety of leisure activities, too.